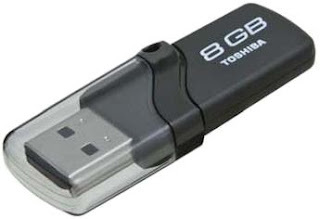 Hey everyone, a few days ago I purchased a new flash drive just like this one above in the picture, a Toshiba 8GB USB Flash Drive, and while having some free time, I decided to try out some custom, real life benchmarking with it, in order to get some facts about the real read/write speeds that it can accomplish. The only modification option we have on flash drives is to make small adjustments to its file system settings (cluster size) while formating from the computer management application (right click My Computer -> Manage -> Disk Management) and in my case the only adjustments I was able to make, were to format the USB flash drive using FAT32 picking a different cluster size each time, choosing from 2 KB up to 64 KB. Afterwards I ran a lot of tests (took me about half a day to complete them all) using a stopwatch in order to check how much time does it take normally for us to copy some files in there, from our main hard disk drive. Note that every time we copy a file in the drive, the operating system splits each file in such small parts according to its cluster size setting while copying them in it. This means that in case the files we copy are smaller than the cluster size, they won't have to be fragmented, but in the case that they are bigger or much bigger they will have to be cut down to pieces of the cluster's size in order to be copied. We should also keep in mind that in case the cluster size is bigger than the files we copy, each file takes more disk space on the drive. Test #1 : Total disk space taken and file size was the same in all. In conclusion, I guess it is a matter of which file type you are mostly using the USB Flash Drive for.. I mainly use it to move files 1~10 MB large so I guess I'll just stick to the 32K cluster size setting. Also I might format it to 16K in case I need to carry over a movie or something huge like that... The good thing is that the format process only takes less than 30 seconds.. So you might wanna switch the cluster size according to what you wanna use it for, each time.. The choice is yours.. I did the research for you and I hope I helped! Thanks for reading and don't forget to check back on from time to time..! Αναρτήθηκε από Solid Snake στις 11:09 μ.μ.